This article is a follow-up to my last post: Grace and the Golden Rule. In it, I explained the meaning of grace which I am further elucidating here. Grace was seen not only as unmerited favour but considerate speech and action. 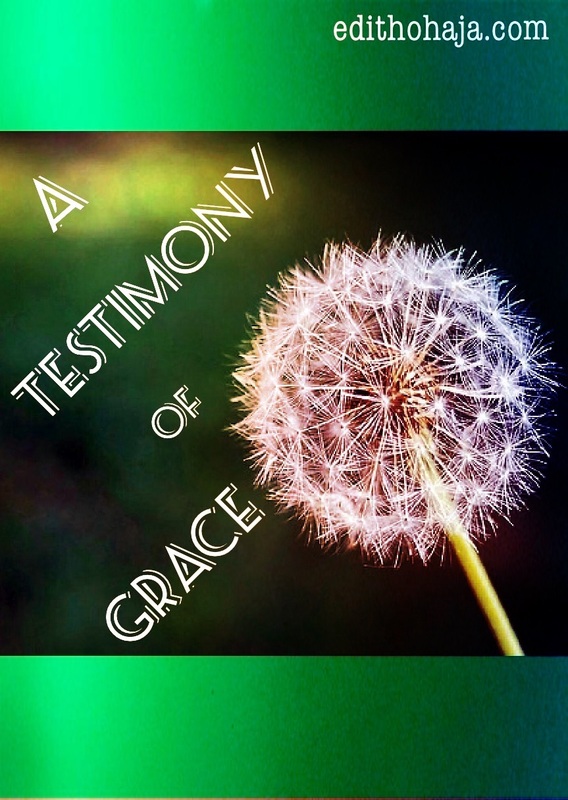 Although I have many testimonies of grace from my dealings with people on and offline, I have chosen my experiences on one medium for illustration. This is a testimony of grace from my interactions online. This testimony focuses on my activities on Google Plus. I have two accounts there that I call Google Plus 1 and Google Plus 2. Shortly after I started using my blog regularly in February 2016, I learnt that I need to get the posts out via social media. I was already on Facebook but sought another channel, so I went to Google Plus. It took me a while to understand how to navigate and fit in there. I would get notifications that So-and-so have added me to their circles but I didn’t know what it meant. Gradually, I learnt that fellowship on Google Plus is mostly via communities, so I joined many as I received the invitations and sent in requests. I love participating in what I join but I had a serious constraint: time. I work full-time while blogging to share the gospel and encourage people. My responsibilities on my job and at home were growing as my social media engagement was growing. And Google Crawler or whatever it is called was dumping my posts as spam except I used a tediously long process of direct posting before adding the links in communities. Then I learnt how to share my posts privately. It was a prayer answered. I could send my posts directly to brethren and they would get notifications I’d shared something with them. But I was concerned that these brethren, some of who were owners and active participants in the communities I belonged to, would be angry with me because I was mostly interacting outside the confines of the communities. Also, I was worried about people feeling bothered by my private sharing. I would be the last person to do something that I know might get on someone’s nerves. Here’s where the testimony comes in. The brethren on Google Plus have been so accommodating and so kind to me regardless of my inability to meet up with showing up in the communities.The fellowship of believers over there is so warm that I have made some very special friends there in these past months. I call people “beloved” whom I’ve never met before because of the affinity I feel with them in Christ and they return the gesture. When we disagree, the connection remains unbroken because what we share in Christ is greater than our doctrinal differences. We often hear of people blocking others online for daring to state opinions on a matter, which happen to be contrary to theirs. There is so much stuff to read online and people sometimes feel harassed by notifications. I try to share mostly a few times a week to give my receivers space and many actually read these posts. I too receive loads of notifications and I endeavour to check them out as soon as I can. Naturally, there may be some who sometimes may not have the time or disposition to read as they have a lot on their hands. But you know what, whatever the case, a lot of the brethren respond in one form or the other (liking, commenting and sharing). I see support and loyalty that only our bond in Christ can explain. This is the testimony of grace that I am sharing. I have presented it in general terms but I want to use my relationship with a particular sister, Pamela Johnson (pen name Beaute’ Naturelle), to typify what I’m talking about. (There are many others I could have used but the article would be unwieldy.) Beaute’ and I had a misunderstanding in my early days on Google Plus. Here’s what happened: I was looking for contributors to my blog. I had created a Category called “Guest Posts” and saw some lovely posts on her Engaging the Word page. I was particularly interested in one where she said believers were using God as a vending machine. I contacted her and left my email address. After a few exchanges, I asked her to tell me plainly if she wanted me to use her work as a guest post or not, that I felt she may not be interested but was just giving me the runaround. She apologised and said I’d misunderstood her attempts to get to know me better. I apologised for jumping to the wrong conclusion. I so respect her for that. She could have told me to get lost. She could have felt after all, she didn’t know me from Adam and didn’t owe me anything. But she checked the work for errors and sent it to me via email. We need to imbibe grace if we are to show the meekness of Christ and live peacefully with others in this strife-torn world. I thank God for bringing me into fellowship with my brethren on Google Plus and elsewhere through whom He is teaching me how to exhibit grace everyday. I pray that He surrounds you with precious folks like these as we continue the journey of taith in Jesus’ name. Being kind to people creates an approachable atmosphere, it might be noticed here that ur heavenly compliment which u use to approach them creates a wider relationship and is indeed worth applauding. may God bless and uplift ur spiritual life..!! Amen. May God bless and uplift you too in Jesus' name. Lol, my aunty jumped to a wrong conclusion. Well it happens attimes. But for her to apologise, it was really by his grace especially if she was a Nigeria cos i knw what we Nigerians are capable of doing. Well everything good that happens in our life is by God's grace. Remember he is the author of our life. He has planned everything in our life so everything works out the way he has planned them. Kudos! And as for the google plus. We re still learning hoping that one day I will be like you. Good morning! Lol, Flawlex! We're all learning and God will help us. The sister is an American but I don't think all Nigerians are brash. You are highly blessed in Jesus' name. Everything happens for a reason, a time, and a season. No "coincidence" with our Lord. I just love your stories and your posts. The Lord lead me to read one of your posts and I was truly blessed. I have been blessed ever since. The Lord has given you a gift and you are using it for His glory and purpose. As it should be. Thank you Lord Jesus for this sister You have put in my life. May the Lord keep blessing you abundantly!!! In Jesus name, Amen Amen Amen!!! Awwww, Roberta, it's brethren like you that made me share this testimony. Your words are always kind and full of encouragement. I am blessed to have a sister and a friend like you. May the Lord keep you in His love and multiply your blessings daily in Jesus' name. Thank you, dear! Without His grace, we will keep bungling things for ourselves and others. You are blessed! 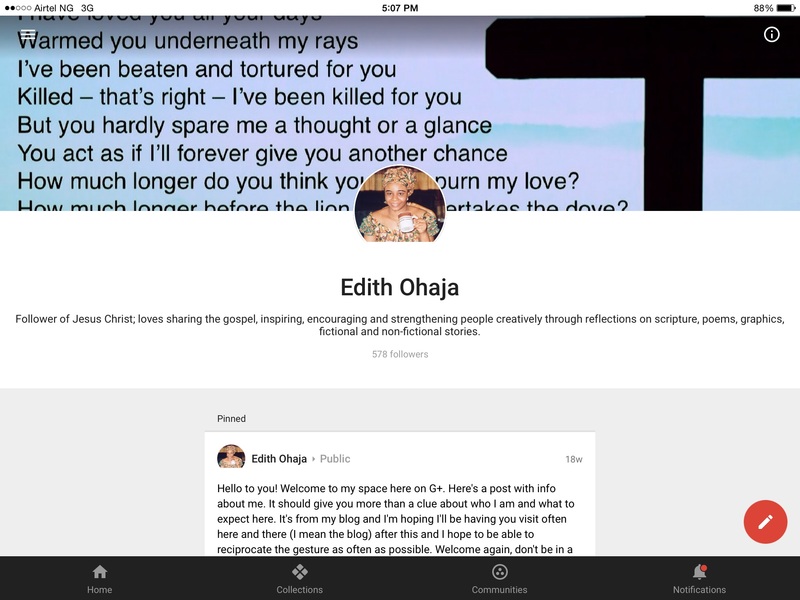 Oh Dear Edith Ohaja! I am truly shedding tears. I am speechless at the honor you have bestowed upon me dear sister. The Lord took what the enemy could have turned into a bad situation and covered both of our hearts with Grace. We are now two sisters walking as one. I so hope that we can one day embrace each other face to face and sit and talk and talk and talk as girls, lol. Again thank you for using our experience to foster love and trust for our Lord. God bless you beloved one. Now I'm close to tears too! Thank you for being the bigger person. I know I'll keep learning from you and my other wonderful brethren that I meet in various fora. Iron truly sharpens iron. Keep shining the light of Jesus. Love you loads. ??? And His grace is sufficient for us. Thank you, Victor! What a great illustration in the real world. Oh how we need to extend grace as God has done. I very much enjoyed this Edith. Thank you! Thank you, April! Glory to God! Greater grace upon your endeavours in Jesus' name. We all need the grace of God to do the right thing always. Some people do not believe in the grace of God and so they think that it is all by their strength. I pray that God, through this kind of illustration,make such people to understand. Amen. Praise God and bless you, Patience! I concur. Amen in Jesus' name. Bless you, Osmond! Amen. And I pray you receive the grace to shine for the Lord where you are in Jesus' name. In all that we do we should ask for the grace of God. You're right! We're apt to make a mess of things otherwise. "Give and it shall be given to you, pressed down, shaken together, running over." So often this beautiful verse is only applied in terms of finances, but it's such a universal truth. If you are in need of grace and kindness... GIVE and it shall be given to you. We are so easy to demand others give to us what we want and fail to give it out as liberally as we would like to receive. Just think how radically our society would change if instead of demanding love, peace, long-suffering, understanding, gentleness, or whatever, we all changed our mindset and began by giving in generous doses that which we would also like to receive. You're right, Karen. The Golden Rule, if universally applied, will drastically reduce strife in the world. Very true. Bless you, my dear! Kind people deserve kindness in return. The kindness in your heart and attitude speaks for you Ma and that is grace that can only come from the Almighty and may he continue to shower you with more of it all the days of your life. Amen and amen in Jesus' name. Thank you so much for your kind words and that beautiful prayer. May God also cause you to be appreciated and blessed in Jesus' name. When Paul writes, “For the grace of God has appeared,” he is referring to the embodiment of grace in the person of Jesus Christ, who was “full of grace and truth” (John 1:14). I am delighted to read this personal testimony. Thank you, my dear! You are a splendid testimony yourself. Keep it up! I thank God for your brethren at Google plus and for bestowing upon you the grace to interact and relate with them in love. Amen. Where brethren dwell together in unity, anointing flows. So says, the Holy Book. Bless you, Gideon! Amen. Thank you for your kindness, Matthew. May your life be exceedingly graced too in Jesus' name. Yes this is true. There are many cases in my life where it was just God's grace that prevented me from making harsh and terrible comments i knew i would regret. His grace has really prevented and solved lots of misunderstandings in my life and association with people. Thank God for you, Shalom! It means you pay attention to the Holy Spirit and obey. Keep it up, my dear! Truely,we are surviving by his grace. Especialy in my own case.thanks a lot for this spiritual reminder. It is well with you ma! God's grace is all we need in all our endeavors. Even when it seems as though we are lagging behind, grace paves way for us. I pray we will all partake in this anointing of grace and have our own testimonies to share. Amen. May your testimonies abound in Jesus' name. many preach what they don't do as individuals. Aunt, am happy because you really do what you preach (most especially your graceful attitude towards students) and I pray that our pastors and leaders will keep to what they preach in order to enable their followers act in line with what they preach. Amen. All glory to God! Well ma this post is very enlightening to us Christians, especially as it pertains to our dealings with others. As Christians, we need to imbibe grace in wathever we do, we should think gracefully, talk, act in short every thing in our life should be done gracefully. our God who is the father of grace has always shown us this grace and will continue till he comes to take us to be with him. so as Christians, I think we should make it our cardinal goal to show forth that grace in our life and extend it to others. I agree in toto. You're highly blessed, Florence! The grace certainly makes a huge difference in how we fare. You are blessed, Ruphina! Grace is all we need. Good advice. Thanks a lot, Mercy, and be richly blessed in Jesus' name. God's grace will always be sufficient for us if truly we believe,nice piece ma.. Thank God for his grace upon your life and I pray for more as you undertake other tasks. Amen. Amen in Jesus' name. Thank you so much, Chiemerie! That I've been able to come this far in life is all because of fabulous GRACE. let me tell us one gracious miracle of His that i'm experiencing now. Commenting on this wonderful blog is actually a gracious act from God to me. It might sound funny, but believe me if I should say "you don't understand." Because truly, you don't. I'm busy writing all these comments with some else's DATA. she voluntarily gave me her modem to run these comments without any charge. Sweet heart, it can only be His GRACE. and I see this same GRACE providing me a sweet nice phone. Grace is all we need because it certainly makes a difference in how we fare. Am full of great pleasure to read this personal testimony. Over the years, I have learnt that arguments profit nobody. Thank God you are a witness to God's grace. I pray you see more dimensions of it in all you do. Amen. God is ever ready to give his Grace to us. May the grace of God which passes all understanding keep our hearts and minds in the knowledge and love of God. May the Grace of God always remain with us, for as long as we are christians, we need His grace in all our endeavours. keep touching lives, ma'am. By God's grace we can achieve the good things we seek, and overcome temptations. His grace is sufficient for his children. Am blessed by this. You have GRACE working for you Ma'am, a special one in that respect. Thank God for his unending grace. It takes a lot to be humble and kind and not to be a snob or haughty or proud or pompous. Everyone needs the grace of the Lord in their life. It's this grace that helps us to keep the Lord's words in our heart and mind. Kudos to yo,u madam! You are really doing a nice job! There is nothing we can achieve without the grace of God.May he continue to shower you with his abundant grace. God is the only one that can handle some issue most especially when we don't have anyone that can fight for us ,so ma he really fought for you, keep up your hard work. Your sincerity will not fail you ma. When there is God's grace, differences do not amount to disunity. Wish you more favours mum. The grace of God is a mediator between our differences. I thank God who gave you the grace to yield to His grace. Wish you more favours. I see your initial concern. i myself would hate to be bothered by unnecessary notifications but i would willingly accept posts and notifications based on faith stories like those on your blog. It's a great blessing that you didn't give up. Thank you so much, my dear! God's grace has been with me all the way. Ma I love the story.Yes is true we all need the grace of God to do the right thing. Without his we cannot do anything well on our own. This is quite a testimony! i appreciate the story and it relates to someone i know very well. She also was affected by the same thing but i really appreciate your perseverance in this case. Stay strong madam. The experience that we have or face only serves to improve us and make us better persons, individuals that are positive and strong; but it can only be so if we rely on the Lord. The grace of God is sufficient in our lives, that is why we always implore for his grace in all our endeavors if not his grace u would have stopped at the inception.ma..Keep touching lives. Truly ma, Grace prevents disagreement from breeding bitterness and breaking relationship. Nice quote! Grace indeed is an unearned favour. The Grace of God is what actually helps us to do what ordinarily we can not do as humans... Aunty Edith, the Grace of God was what saw you through. More Grace to your elbow! We cannot do without the grace, it sees us through in all ramification of life. What a wonderful write up, Ma! This is such a wonderful testimony. Grace is real and when one is connected to God, grace manifests itself in every aspect of their lives. Indeed, grace like love is kind and accommodating. It is an unmerited favor from God. And to talk of the kind Pamela Johnson who graciously agreed to giving out her post to be a guest post. It is awesome when grace is working for us. Lovely piece, Aunty Edith. In Gods Garden of Grace, even a broken tree can bear fruit. I loved the way this write up was able to remind me that Grace never leaves us the way it finds us. I thank God for his grace upon your life ma'am. This is an inspirational post, grace assures a life of fulfilment and progress. To do the right thing nowadays, we need the grace of God in abundance. Ma, thanks for the illustration because we, sometimes, are choked with duties that bug us down. God can use any medium to prove his abilities,He has really shown his love towards you through the unmerited favour you enjoy.He will continually strenghten you until you get to the apex. knowing who you are in Christ Jesus helps you condone a lot of things, the Holy Spirit guides our thoughts and actions if we let him. I've learn't that grace doesn't breed bitterness. As Christians, we need to imbibe grace in whatsoever we do, we should think gracefully, talk, act in short every thing in our life should be done gracefully. our God who is the father of grace has always shown us this grace and will continue till he comes to take us to be with him. so as Christians, I think we should make it our cardinal goal to show forth that grace in our life and extend it to others.